A thriving network of hot tub and swim spa dealers has helped Wellis distributor and Superior Spas Managing Director Rob Carlin to capitalise on booming wet leisure consumer demand and ensure record-breaking sales growth. Rob and his team had a large display presence during the Hot Tub Living Expo at the Birmingham NEC last week to promote new options, including the Rio Grande swim spa, pictured, which has a separate dedicated seating area for three people, to current and prospective dealers. They now have a wide choice of hot tub and swim spa models from Hungary-based manufacturer Wellis, which has been instrumental in Rob’s network doubling its sales from the previous year in the British market. Among the high sales performers this year has been the six-seater Superior Spas Fiji, which has gained its first ever WhatSpa? Best Buy Award for the distributor and his European manufacturer. The WhatSpa? 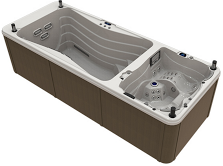 Verdict praises the Fiji, which made its Best Buy debut in the £4,000 to £5,999 price category of the consumer magazine, for being a ‘well proportioned and spacious seven foot hot tub’ and proclaims it to be a ‘top specced, value-for-money spa that takes some beating at the price’; as well as highlighting that ‘there’s no shortage of flow and massage options in every seat’. The seven-seater Wellis Elbrus Deluxe has also been awarded with its maiden WhatSpa? Best Buy Award, which is currently being promoted in the latest Wellis brochure, along with the the WhatSwimSpa? Best Buy Award-winning Wellis Danube Power Swim Spa. A three-seater ‘Made in Europe’ Myline Spa Mars model; which Rob distributes along with Chinese-manufactured Platinum Spas options, has also been awarded with a first WhatSpa? Best Buy Award. “It’s been crazy this year and our sales have more than doubled compared with our 2015 figures,” said Rob. “Like the industry as a whole, all of our dealers have recorded good sales this year and I can’t believe how well it’s gone so far with the support from Wellis. Rob also revealed that three new models, including a five lounger seat design, are currently being prepared for dealers to promote in their showrooms next year. 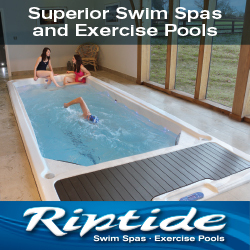 They will be given their European debut at the four-day Piscine Global wet leisure showcase in Lyon, from November 15 to 18, ahead of the official British launch at the Ricoh Arena in Coventry during the 21st edition of SPATEX, from January 31, to February 2. “We’ve not yet received details of the names of the new tubs but they will be revealed officially at Piscine Global in Lyon, ahead of our second appearance as an exhibitor at SPATEX,” said Rob.